If you are a DIY mover you are likely a resourceful individual with plenty of energy. Moving yourself is not for the faint of heart and you are to be congratulated for your ambition. As a moving expert who has been in the industry for 20 years I want to share some helpful tips that will guide you to a successful move. The fastest and easiest way to get a quote is to look on the company’s website. You can call or fill out a quote calculator on the companies home page. Make sure you are as accurate as possible in selecting the right size of truck and additional equipment. For example, you may want to include a trailer to handle your vehicle transportation. To narrow the field there are a few things that you should look at when comparing quotes. Start by reviewing the final cost and eliminate the ones that exceed your budget. Next, go through the remaining companies and separate them into two groups – ones that offer the services you need and ones that don’t. In some cases, truck rental companies will quote you the bare minimum price for their bare minimum services so make sure that you add in all assessorial charges. Most rental companies will allot you a certain number of miles for your move. If you exceed that number, you will be responsible for added charges. Therefore, compare the quotes to see who gives you the most leeway in terms of mileage so you can ensure your costs remain under budget. Check out your options for insurance before accepting a quote as an accurate representation of the total cost. Rental companies usually have chargeable items and/or penalties that the renter often discovers after they return the truck. These penalties usually include items like cleaning fees and fuel replacement. Be smart about you handle your truck and return it clean and filled up. To ensure you pick the best truck rental quote, find out what these “hidden” chargeable items include so you can be sure the amount quoted is the amount you’re going to pay. When comparing truck rental quotes, it pays to slow down and read the fine print. You might have to dig deep to discover the costs of insurance coverage, extra fees, penalties and fines but by doing so, you will have a better idea of how a particular moving truck’s rental agreement will fit into your budget. These companies deliver a portable storage container or a mobile storage trailer to your residence. You are then responsible to load it and they return to pick it up and ship. People that use this option don't have to worry about all the headaches of driving a large rental truck to their new home because the company will do it for you. This option is typically used for moving longer distances but it can also be a good option if you only need temporary storage. Your two most popular companies that fill this niche market are PODS and ABF. Make sure that you check online to see if they service the area you live in and the area you are moving to. One of the most popular portable storage container companies is called PODS. They serve there customers by delivering a small mini-storage unit to your home. These containers usually fit nicely in an average drive-way and range in size from 7ft - 16ft. An advantage of using this option is that these containers are ground level for easy access. The leader in mobile storage trailers is a company called ABF. This company is actually a trucking company that delivers one of their large freight trailers to your home for you to load. It's important to know that these are trailers originally designed for freight not household goods. Their trailers are 28 ft. long and typically can hold 3-4 bedroom homes. One advantage is that ABF has good nationwide coverage and are able to service most areas. Regardless of which option you may use, make sure you understand all of your charges so you don't go over budget. Because these companies aren't actual moving companies they may not have extra moving equipment. Make sure you check on the price and availability of packing materials, dollies, and furniture pads. Remember that your items will get damaged if they are not well protected during the loading process. Also check out your options for insurance before accepting a quote. Adequate insurance can save you a lot of stress if your items arrived damaged at your new home. Choosing family and friends to help you load/unload can be a great way to save you money. If you choose this option consider asking friends that have the strength and awareness to carry and load furniture. Sometimes a willing heart is not enough to get the job done. No body likes to move but it can be an opportunity to enjoy spending time with friends. It's always a good idea to buy them lunch and keep plenty of fluids on hand for them to drink and stay hydrated. Because they are your family and friends be sensitive to the relationship by not being bossy or unthankful for their efforts. It's also good to remember that your items aren't getting handled by professional movers so some damage is possible. If you are really particular about your furniture then friends may not be your best option. If you are concerned about the level of care you will receive from well meaning friends then consider hiring professional loaders to help you. If you still have friends that want to help there are plenty of other helpful tasks like packing boxes, dis-assembly of furniture, and disconnects electronics and appliances. ​​Many do-it-yourself movers avoid the back breaking work of loading or unloading by hiring professional to load or unload their rental. The advantage to hiring professionals is that they understand how to handle your property carefully with minimal or no damage. They also know how to fill your rental to it’s full capacity and make sure that you get the greatest use out of your rental. The best way to locate a moving labor service is to search on line by typing in 'Moving Labor' and the community you are needing help in. Labor services fall into two basic categories - moving companies or referral web-sites. The first category is local moving companies. Most local moving companies will serve the do-it-yourself mover by helping them load their rental. The advantage to this option is that you are dealing with a company that is fully invested into the moving industry. Their employees are likely well trained in the latest carrying and loading techniques. It's always good to research the company before you hire them. Review the companies web-site to see if the company looks right for you. Ask family and friends who they might recommend a moving company. Look for red flags like bad on-line reviews or a bad or non-existent Better Business Bureau rating. The second category is referral web-sites. These companies focus on finding and compiling a list of moving labor providers in your area to choose from. 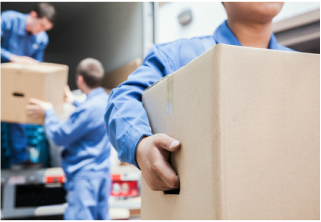 It's important to know that when hiring moving helpers from a labor referral service you are not hiring their employees. In many cases it's quite easy for people wanting to make extra money but have no experience to become a moving helper. Make sure that the actual individuals that you are hiring have a good reputation so your home work. In most cases you you not be able to get any insurance coverage for the services of moving helpers. It's always a good idea to check for online reviews before hiring a moving helper. Popular online options to consider are: https://www.movinghelp.com/ and https://www.movingstaffers.com/. Best Wishes On Your Upcoming Moving!